Remove dough from wrapper; break up dough into pan. Press in bottom of pan to make 1/2-inch-thick crust. Bake 9 to 11 minutes or until lightly browned. Cool completely, about 20 minutes. Spread lemon curd evenly over crust. Using 1-oz scoop, top lemon curd with 16 scoops of frozen yogurt. Freeze about 1 hour or until yogurt is set. 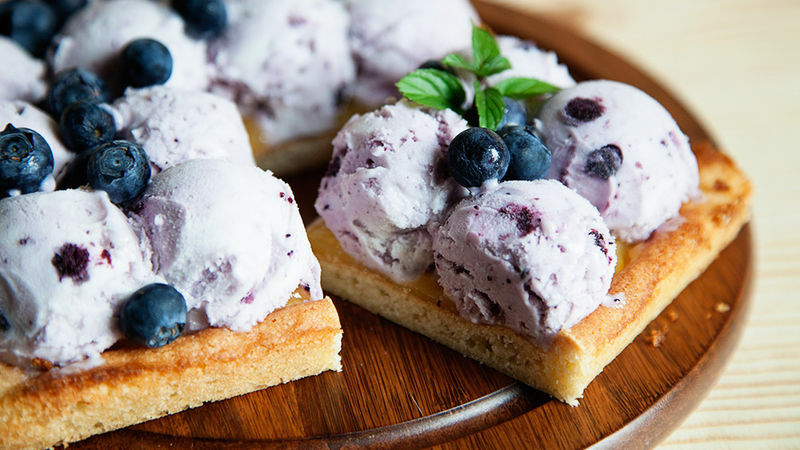 To serve, top with blueberries and mint. Cut into 3 rows by 3 rows or 4 rows by 4 rows. You can use any size pan that you like—an 8-inch square pan for small servings or a 13x9-inch pan for a larger crowd. The size is up to you. If you use the larger pan, press the same amount of dough in the pan, increase the lemon curd to 1/2 cup, the frozen yogurt to 1 1/2 containers and the blueberries to about 2/3 cup. If you don't want to use the scoop method, let the frozen yogurt thaw for a few minutes and spoon onto the top of the crust, smoothing to create a flat surface.